Our friends and partners at the Riverside-Corona Resource Conservation District are hosting Dr. Gordon Pratt for a seminar on how to create a butterfly habitat using native plants. 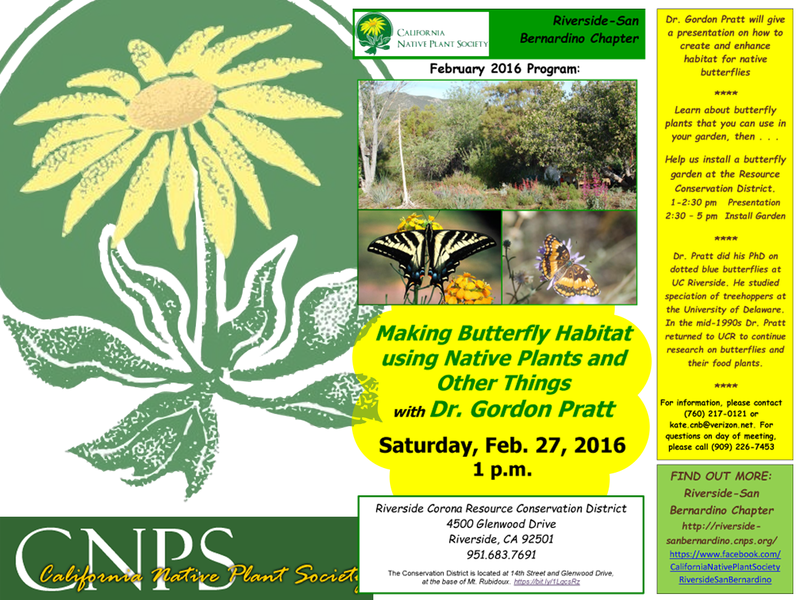 The event is sponsored by the California Native Plant Society and will take place on Saturday, February 27th, 1PM at RCRCD’s beautiful natural habitat demonstration grounds, 4500 Glenwood Drive in Riverside. Erin from RCRCD says, “One out of every three bites of food is dependent on pollinators like the butterflies, bees and hummingbirds that will enjoy this garden.” Come out in February to learn how to help create a beautiful city, a smart city, and a better food city.